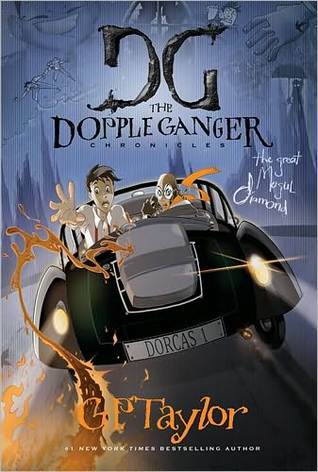 The Dopple Ganger crew is back in their 3rd adventure by G.P. Taylor. No more “School for the Wayward Children” for them. The twins, Sadie and Saskia now live with Muzz Elliott the famous mystery writer. Erik lives with Dorcas Potts, the investigator’s Uncle Gervez. Muzz gets a phone call that the kids over hear and realize that Muzz is being blackmailed. The twins and Muzz quickly take a trip to the south of France first by train, then boat and then a Pullman. There they are to meet with the blackmailers. As they are travelling Saskia who is reading Muzz’z novel realizes that much of what is happening is coming straight out of the novel “Murder Train”!. They are drugged through French Cocoa, Sadie is kidnapped and a suspicious Max Taranis lurks nearby. Meanwhile, Dorcas and Erik are hot on the twins trail as they zoom through the mountainside in Dorcas’ very fast Bugatti (car). Of course the bad guys are just around the corner to thwart any rescue attempt by Dorcas and Erik. More chaos ensues once the team is back together in Cannes. The blackmailers want them to steal the Great Mogul Diamond up for auction in return for Sadie, similar to Muzz’s novel “Another Day, Another Diamond”. Fast paced book with an insane amount of adventure, just what kids like. Font variations, comic pages, actual photographs, Black background pages with white print, and illustrations make this book very unique in it’s presentation. It goes along great with the fast paced nature of the adventures, and the ‘darkness’ of the bad guys. I would say this book is geared for tweens as it is easy to get confused with the characters and places in the book as it is so fast paced. Reluctant readers will find it fascinating.